Is the hotel equipped for impaired guests? Yes, we do have one room equipped for impaired guests, and such room can hold two or three people. Is there a wi-fi connection in the hotel? Yes, we have a wi-fi connection avaialable free of charge all around the hotel (i.e. in public areas and in the rooms). Is the hotel open 24 hours? Yes, the hotel is open round the clock - during the night a night porter is on duty and therefore you may come back at any time. For everybody's comfort, we kindly ask our guests to avoid any unnecessary noises along the hallways during the night. Is an english speaking doctor easily available should we need him? Of course do we hope that you will not incurr in any health problems during your holiday. However, just in case, an english speaking doctor is always available on call - and a 24hrs english speaking pharmacy is just around the block - remember, that non european citizens will have to pay for visits and medicines, but if they keep the receipts, they will be reimbursed by their insurance company once at home. For worst cases, the hospital is only three blocks away. Is there a safety box in each room? Yes, of course, each room is equipped with an individual saftey box. We are leaving florence on an early morning flight- is that going to be a problem? Are all bathrooms en suite and do they have a shower or a bathtub? yes, all our rooms have a private en-suite bathroom. Also, all our bathrooms have a shower - however, many bathrooms have a tub and shower combination. If you prefer a tub, just let us know and we shall try our utmost to accomplish your requirement. Does the hotel help in making restaurant reservations? Yes, of course, we shall be happy to help you with that !! and with suggestions, too !! however, do remember that only top notch expensive restaurants take reservations long ahead of time - most restaurants only do so for the same or the next few days and therefore we shall be able to make them once you are over here. Our family/party is composed of five members- does the hotel have a room large enough for all of us? Yes, we do have two very large units which can easily hold five people - of course, each of them is equipped with private bathroom, air conditioning, color tv, telephone, etc..
What is a studio room? In europe a quadruple room is a larger room intended for four people people to share. The bedding can be arranged to have either four separate twin beds (i.e. for four friends travelling together) or a double bed plus two single ones (i.e. for a family with two parents and two children). Just let us know your preference upon making the reservation. In europe a triple room is a larger room intended for three people to share. The bedding can be arranged to have either three separate twin beds (i.e. for three friends travelling together) or a double bed plus a single one (i.e. for a family with two parents and one child). Jjust let us know your preference upon making the reservation. What is the difference between a double and a twin bedded room? a twin bedded room as a room for two people with two separate single beds, generally intended for two friends, mother and son, sister and brother, etc..
it is usually not a problem to have either kind of rooms, as long as the preference is asked for upon making the reservation. in europe single rooms are rooms intended for one person only - they are equipped like any other rooms but usually they are slightly smaller in size and sometimes (but not always) have a king/queen size bed. the cost for a single room is usually quite a bit higher than half the cost of a double room. Our arrival time in florence is quite late-is that going to be a problem? No, not at all - but it is always better to let the hotel know about that - even a short phone call will be sufficient (mobile phones are very handy nowadays). Yes, of course, all rooms are on the second floor of the building (americans call it 'third floor') and there is an elevator which serves all floors. What is the best schedule to visit florence over the week-end and on monday? 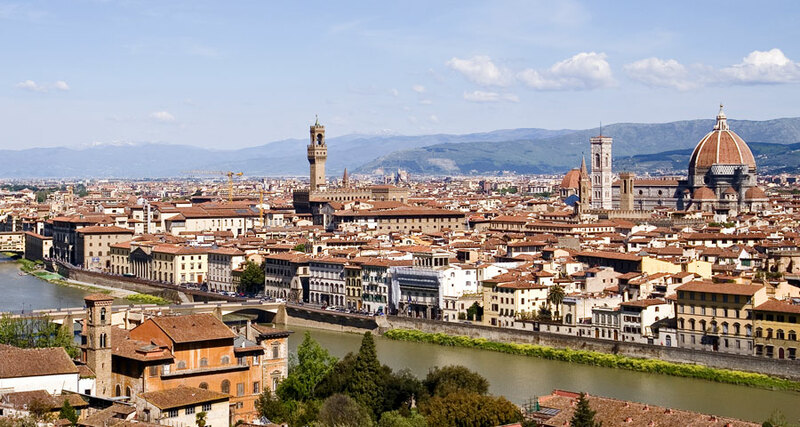 Florence has a lot to offer on any day of the week and nobody will ever run out of things to visit or do. churches are difficult to visit on sundays due to religious services; the three main museums (i.e. uffizi, accademia and pitti) are closed on mondays and therefore they can be visited either on sundays or on tuesday morning. Yes, of course, upon your arrival we shall be pleased to assist you in making reservations for tours and walks around florence and/or tours to siena/san gimignano, chianti vineyards, pisa, etc..
We are also able to arrange private chaffeur driven minibus tours in case you are a small party or you have some special requirements. Does the hotel provide laundry/ironing service? Yes, of course, we do provide same day laundry and ironing service (except on sundays and on holidays), for a small fee. also, a self operated laundry outlet is also available just around the corner and it is open every day until 11pm (last wash at 10pm). Yes, of course, each room is equipped with a hairdryer in the bathroom. Our check-in usually starts around noon-1pm, whilst check-out is by 11am-noon. Both on arrival and on departure days, you are more than welcome to leave your luggage with us should you arrive early or leave late in the day.